If there is one thing that can completely destroy the quality of your power nap, it’s light. So a good eye mask can be a game changer when it comes to power napping. Below are five different light blocking devices I’ve tested and my thoughts on each one. I’ve listed the devices from least effective to most effective. It feels like you have a beanbag around your head (it contains soft beans inside). 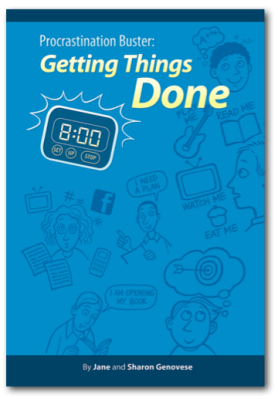 This device is multi-functional. In colder climates, it can slide down and make a neck warmer or neck rest. But if you live in Australia, you won’t need a neck warmer (it’s boiling hot here. In Summer your neck is permanently warm). This device creates a lot of noise rather than blocking it. Every time I moved my head, I would hear the noise of the beans moving. 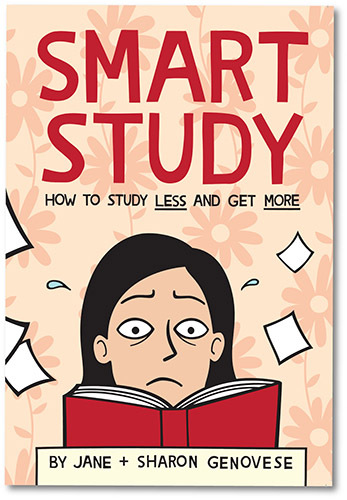 I found this distracting. This device left me feeling disoriented. My eyes hurt after every nap. Perhaps this was due to too much pressure being applied to my eyes. After each nap I would stagger around the house with blurry vision. It wasn’t fun. It’s cheaply made and breaks easily. Even though it can be adjusted to fit different size heads, the adjuster broke after I took my first nap. Just like a beanbag, the beans in this device become compressed over time. This means eventually it won’t make a very good neck rest (which it is marketed as being). It’s a potential ecological hazard. If it breaks, you’ll end up with those pesky styrofoam beads everywhere (note: this hasn’t happened to me but online reviews reveal a number of people have had their OstrichPillow spring a leak). The eye mask on it’s own (without the earmuffs attached) is exceptionally well made. It’s the best device at blocking out light that I’ve come across to date. It has padding around the nose, which makes it very comfortable. Note: But this is just the eye mask, not the whole combo of eye mask and earmuffs. The elastic pinches your head. In order to wear the earmuffs and eye mask together, I had to tightly secure everything to my head. This meant the elastic pinched around my head, causing me some discomfort. I didn’t nap well. The earmuffs don’t block out the noise very well. I live directly under a flight path, so I had high hopes these earmuffs would work their magic. No magic here, folks. You’d be better off investing in a pair of Mack’s silicon putty earplugs, taking off the clunky earmuffs and just using the eye mask with the silicon putty earplugs. I feel this device is overpriced for what you get. For $70AUD you’re not getting value for money here. It’s super cosy. 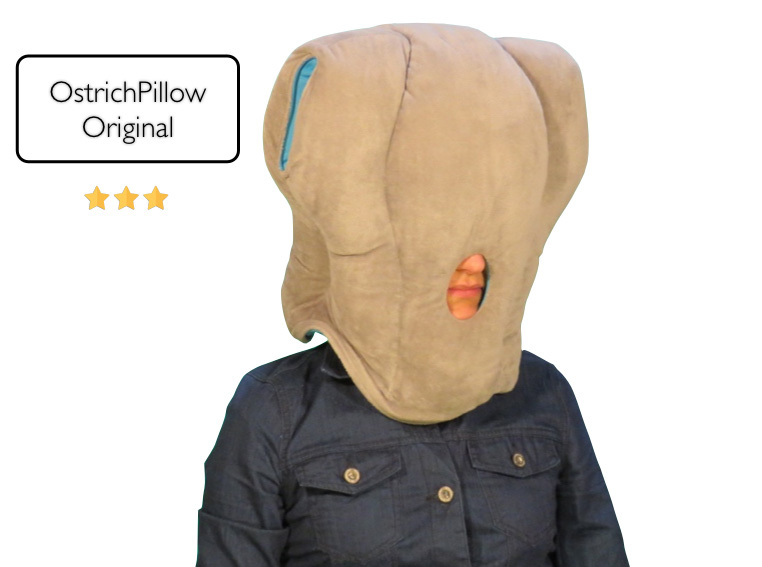 It’s like a pillow that wraps around your entire head. There are two holes at the top for you to insert your hands, so you can nap at a desk. 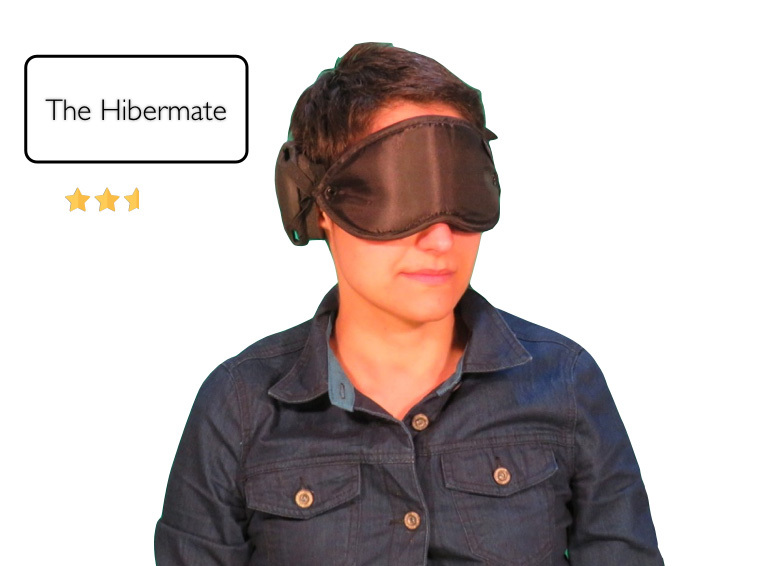 This is marketed as a device you’d wear to sleep on a plane or in a library. 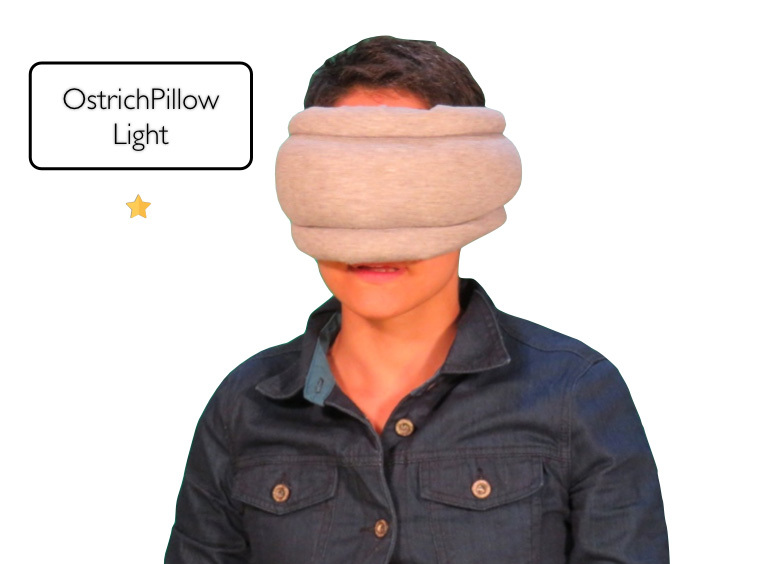 But it would take one brave soul to wear this light blocker out in public. It looks ridiculous. Wear this out in public and you will almost certainly draw attention to yourself. It’s a little toasty and definitely not suited for the hot Australian climate. Warning: Some people mistake the breathing hole as a location to insert their pony tale. If you do this, you will suffocate! It does let in a fair amount of light. 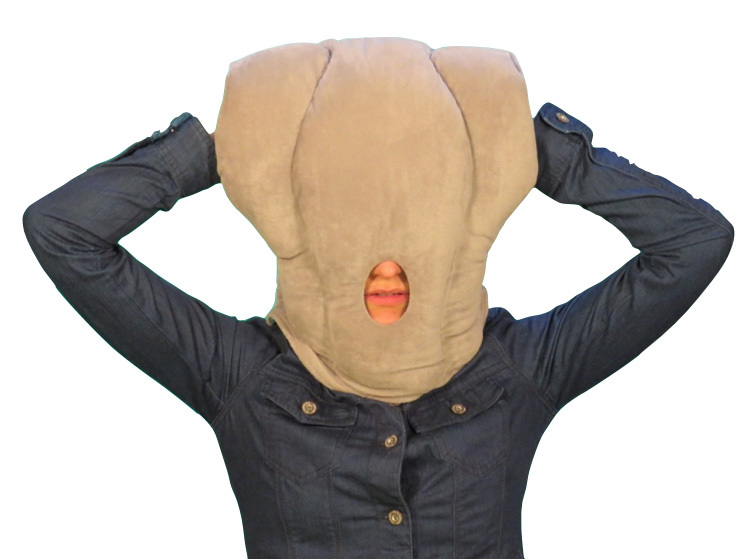 I found myself wearing a simple eye mask with it which kind of defeats the purpose of wearing the OstrichPillow in the first place. 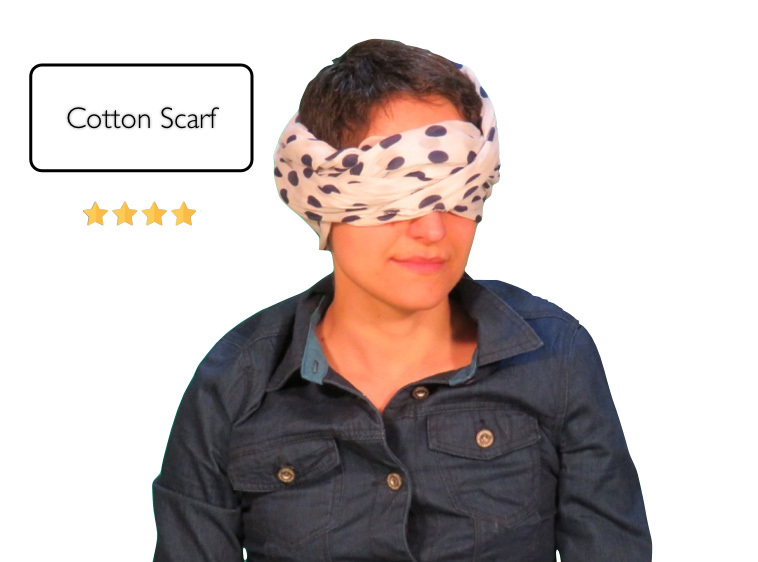 A scarf wraps easily around head nicely with no nasty pinching. Depending on the colour, it can block out the light extremely well (better than most eye masks). You can wear it as an accessory and when you need a snooze, wrap it around your head to block out the light. You may ruin your scarf if you nap on a regular basis. If you wear makeup, there’s a good chance you’ll stain your scarf by wrapping it around your head. Tip: wash your face before taking a nap. It wraps around your head and secures with a velcro strap. This means you don’t experience any nasty pinching. There is a pocket on the device for your earplugs (if you use them). It is made out of a nice satin material, which feels good on your skin. Sometimes when napping, I needed to adjust the mask so no light came in. It can get a little warm if you secure the mask too tightly around your head. So there you have it! 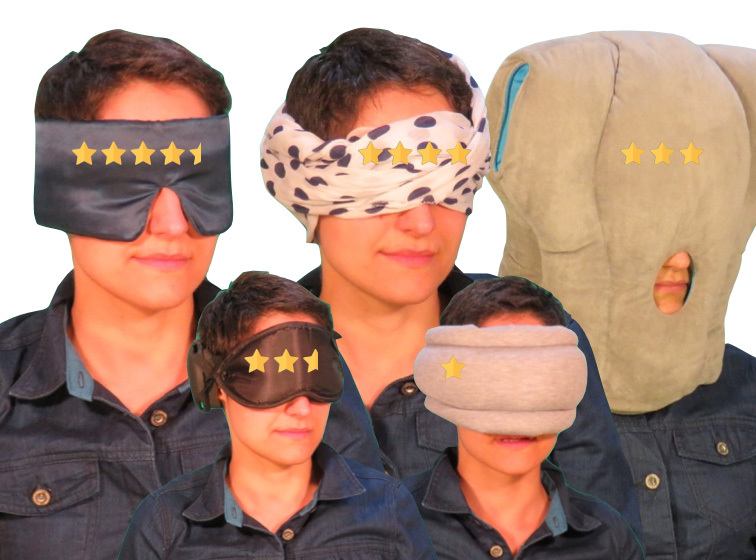 Five different eye masks to enhance (or destroy) your napping experience. 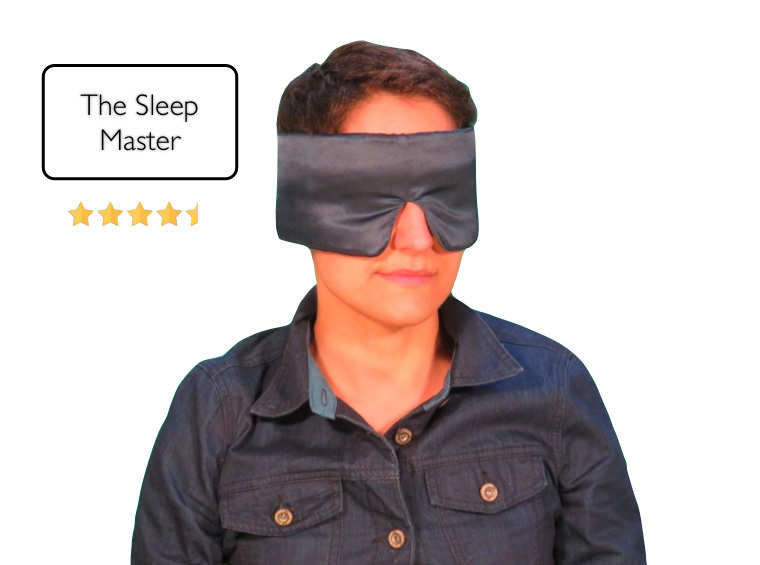 Some eye masks I recommend you avoid, whereas others like the Sleep Master are worth investing in if you’re seriously into napping. But at the end of the day, I didn’t find that there was much of a difference between a soft scarf and the Sleep Master. My best advice: save your hard earned money and make do with a scarf! 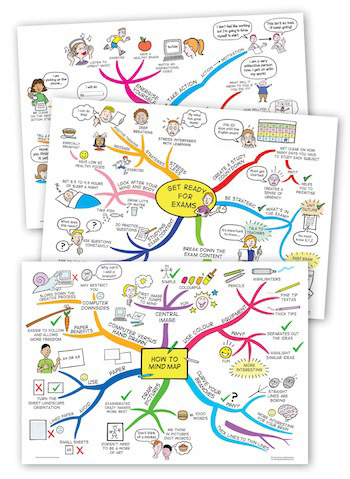 Thanks Jane, I love your lowest tech, lowest cost solution! My current eye cover is a long cotton sock which happened to be on the top of pile of clothes on the chair next to the one I was sitting in when I found myself doxing off and wanted something to block out the pesky light. Like the scarf, it works surprisingly well! A long cotton sock would certainly do the trick!